Scrivener is a fantastic piece of software for writers. The program was developed by a writer who was hunting for some software to help him put together a novel. None of the programs available fitted his needs and so he upped and built one himself. Having said that you can use Scrivener to write anything you want, some people even use it as a project planning tool. Unlike other writing software (NewNovelist, StoryMill and the frankly bizarre Dramatica Pro) Scrivener doesn’t force you to work to any system. Instead it uses the simple metaphor of 3×5 cards on a cork board. With these virtual index cards you have complete freedom to plan, write and revise your stories, books or reports in whatever order you want. Once you’re happy with the final result you can export your collection of cards into an rtf file for formatting in a program like Word or Final Draft. 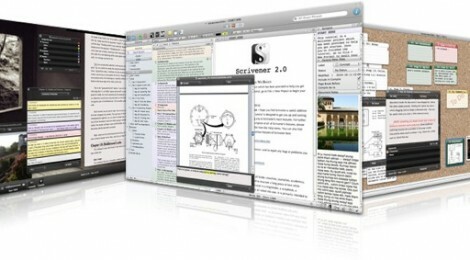 Scrivener also allows you to store photos, pdfs and text snippets in research folders in each file. In this way you can group together all your research and references and access them while writing. Finally it’s got a full-screen mode so you can just see your words against a plain page, free from any distractions. I set mine to a green Courier font set against a black background to go for that cool 1970s UNIX terminal look. This very short summary hasn’t even begun to scrape the surface of what can be done with Scrivener. The program has a huge and fiercely loyal fan-base, including innumerable published authors who’ve used it themselves. Many of them frequent the very lively forum here which, incidentally, is not just about the program itself but also about the joys and heartache of trying to write. I use this program and love it! The best part is the design of the program itself, but an easy second is the cost: inexpensive. It’s way too cheap, there are far worse programs costing ten times as much. I can’t wait for the iPad version.